During late August when the temperatures are soaring and sweat pours from your body, it is tough to be excited about the work required to plant food plots. It is strenuous work that seems lost for many months. However during December and January you may be rewarded for your work! This week has been frigid in the Ozarks and the food plots that were planted in August have been great stand locations. It is alternative methods season in Missouri and we have been taking to Redneck Blinds that overlook large feeding plots with hopes of seeing smoke pour out of the black powder rifle! Glen Woods tagged an Ozark Mountain buck in late December during the alternative weapons season. Keying in on the fact that deer need to eat to stay warm, we had high hopes that a hit list buck would come to chow down on the Eagle Seed food plots. The first sit this week we were not disappointed. Just before dark a hit list buck we call Two Face appeared in the bushes at the edge of the field. Sadly, he out-smarted us and never left cover to present a kill shot. The very next night Grant’s dad, Glen Woods, joined us for an afternoon hunt. Once again, the bucks hit the food plot just before dark. 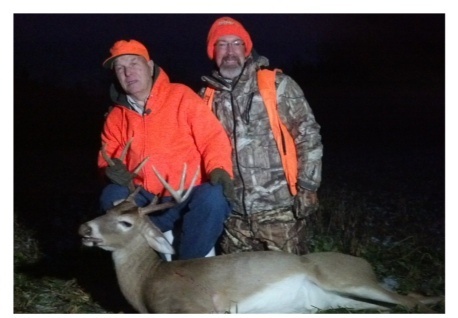 This time the deer hung around a little too long and Glen Woods dropped a buck where he stood! We will continue to hunt evening food sources after Christmas and we hope you are blessed with the opportunity to do the same! Good hunting and may everyone be blessed with a prosperous and happy New Year!